Marja and Heather at a lesson with Shin Chul Kang. 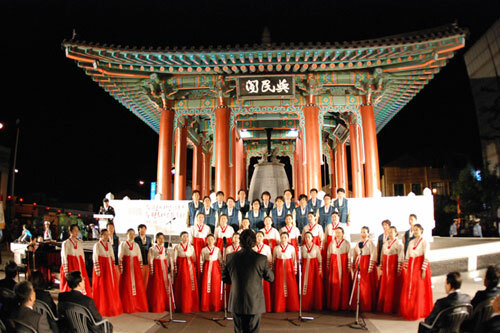 An event at the Hwaseong Cultural festival. Suwon is known for its galbi (sliced shortrib), with its characteristic rich, garlic-heavy flavors and hefty cuts of meat. The city even has an annual galbi festival that has been held for over 15 years. Each June, crowds feast on mountains of grilled meat, and knock it all back with a few shots of soju, of course. Food aside, the city’s known for Hwaseong Fortress, a major Korean historical site that was built in the Joseon Era. Though Marja didn’t visit Suwon, she and Heather were able to experience a bit of Suwon’s culture by taking a lesson with Suwon-based Taekwondo legend Shin Chul Kang, the former coach of the Iranian national team. Suwon has many restaurants which feature its famous local specialty, galbi. Read more about where to find it here. Here’s a great list of places to see in Suwon. Browse Suwon’s many hotels here. Check out Visit Korea and Suwon Tourism to find out even more.